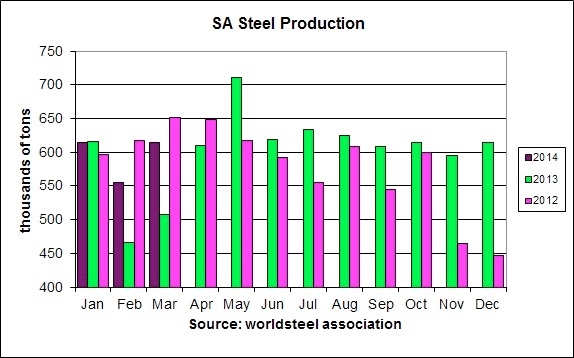 South African steel production accelerated to a 21.1 per cent increase in March to 615 000 tons after a 19.3 per cent jump in February according to the Worldsteel Association. South African steel production is continuing its recovery after a fire at the Vanderbijpark basic oxygen furnace (BOF) plant of ArcelorMittal SA (AMSA) in February 2013 caused a major disruption. The BOF plant was returned to service in April 2013 and this allowed annual production to rise by 4 per cent in 2013. This followed an 8 per cent reduction in 2012 to only 6.9 million tons, its lowest annual production since at least 1980. South African steel production is expected to return to the levels of the years 2002 to 2007, when annual production was above 9 million tons, in part driven by a growing vehicle export programme. Steel is a key input to industries such as the automotive, construction, rail, power, consumer durable goods and machinery sectors, so its health or lack of thereof, is used as a leading indicator by economists. The increase in the first quarter 2014 from a year ago was 12.4 per cent. The International Monetary Fund reduced its economic growth forecast for South Africa to only 2.3 per cent in 2014 in its April World Economic Outlook from the 2.8 per cent forecast in January. Actual growth slowed to 1.9 per cent in 2013 from 2.5 per cent in 2012 and 3.6 per cent in 2011. Brazilian steel production rose by 1.5 per cent in March to 2.9 million tons from a year ago, while Russian production edged up by 1.3 per cent to 6.0 million tons. Indian steel production increased by 3.9 per cent to 7.3 million tons, while Chinese steel production, which accounts for slightly less than half of global steel production of 141.3 million tons, was up by 2.2 per cent to 70.3 million tons.